In my quest to stay on top of deadlines without sweeping everything else under the rug, I identified a few psychological barriers I’d unknowingly put between myself and achieving my goals. Here’s how I solved my problems and got back on the right track, as well as how you can do the same. Don’t name your to-do list items ‘Start on X’ or ‘Think about X’ — if it’s a project of a size that means it needs a start time, then break it down into steps and have one of the steps as a first, easily accomplished goal to break you into the project. A good guideline for your to-do item titles is: ’verb the noun with the object'. While good names follow that pattern, bad item name are mysterious. They don’t indicate a task is actually being done (or are small projects in disguise). Take a look at the state of your to-do list right now. Is there anything on there that you couldn’t finish in one sitting or physical action? Some embarrassing items that have been sitting at the bottom of mine include ‘Content tracking system’, ‘Need a set of landing pages for target keywords’ and the good old ‘look into Buzzstream’. It’s no shock that these items were never acted upon. Skimming through your list and trying to prioritize items for the day isn’t easy when the items aren’t quantifiable. For projects — collections of tasks which could take anywhere between a few hours to a few years — a different approach is needed not just to organize them physically on a list, but to make sure progress is made and it isn’t ignored because of how it’s phrased. The way to do that is by breaking tasks down into chunks. I filter my to-do list by the time it takes to do something, for example #quick, #medium, etc. Whenever I have a burst of energy and want to get a few things cleared off at once, I’ll filter my list by 'by the ‘#quick’ tag (this works in WorkFlowy and Wunderlist) to show all items that can be done in a few minutes. This is all well and good, and can inspire me to start working through little nagging tasks that might otherwise get lost somewhere because they’re ‘so easy they could be done at any time’. On the other hand, tagging things by the time they will take brings up issues when you’re tagging bigger tasks with things like #long. Who likes the idea of starting on something long? And how long does a medium task take, anyway? Anything other than a quick task should, again, be broken down into sub-tasks. I can sadly say I have never ticked anything off my list that I’ve tagged as long or medium. Better options include #project, #research, or a description of the task that indicates its length whilst not making it sound awful. 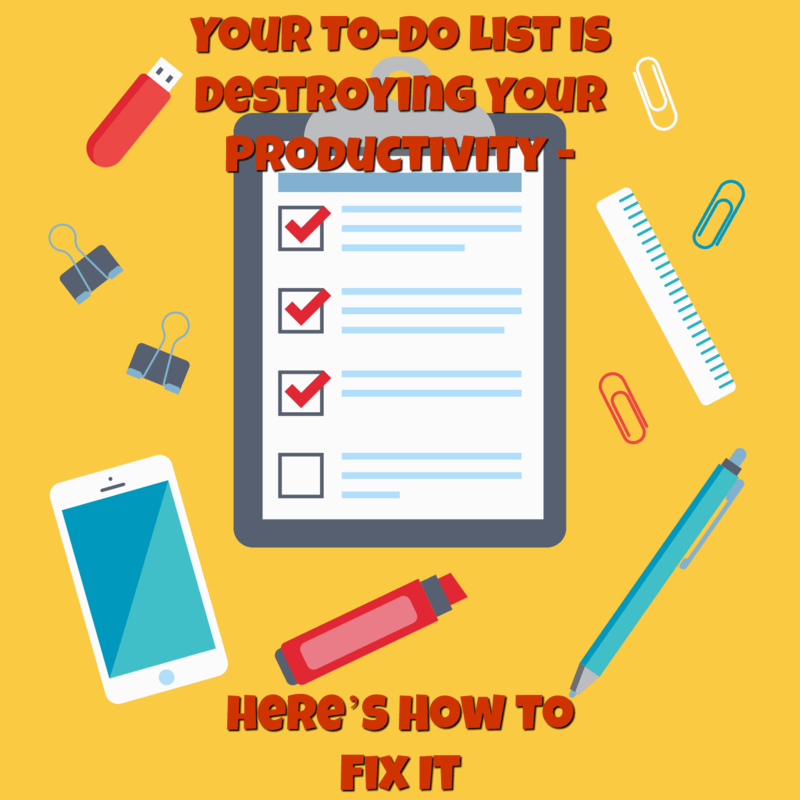 A task management technique a lot of people have had success with is restricting your to-do list to just two items. Why does that work? Well, for people with a success mindset who want to actually get things done, it makes you focus on the two most important tasks, not two inconsequential items that are neither urgent or important. It’s also a form of mental decluttering. A list full of every hope and dream you’ve ever had would be massively distracting, and it’d be hard to discern between which things are due right now and which are part of the overall picture. A way I found of marking my top two tasks is by using Wunderlist’s stars. Pretty much every to-do list app in existence has a way of filtering tasks marked by a star, tag or label. On paper, you can get as creative as you like with how you mark important tasks. The rest of the tasks which aren’t in the top two should be kept not lower down the list, but in a totally different section. For to-do list app users, a separate list called backlog or inbox is a good call, but for a more old-school method try a separate page or dividing line which makes it clear that you shouldn’t touch that until this is done. About a month ago, I set a system up to make sure I completed all of my daily tasks. This is about 10 tasks of varying complexity, from a bit of housekeeping to the king of busywork — inbox zero. I set reminders throughout the day which would trigger as push notifications on my phone and desktop. You would think that it would keep your tasks top of mind, but what it does is desensitize you. A soundscape of distracting chimes reminding you to vacuum when you’re in the middle of something important puts you off the whole task altogether. And when you see it’s overdue for 12 days already, it’s not the most motivating thing. A study into the distracting effect of notifications revealed they have an effect on your productivity even when you ignore them, Would you believe they’re equally as distracting as a phone call? Setting up notifications that will distract you from focus work can ruin your efforts and throw you off track badly. With the huge range of task management software out there, it’s easy to accidentally scatter your tasks between apps that you don’t visit every day. Think about it — Evernote has reminders, so when you’re working inside there you might be tempted to quickly set one up for a task you’ve jotted down. Trello has due dates, WorkFlowy has completable list items and Gmail has reminders attached to emails (but it is best to keep your to-do list items out of your inbox). Even Slackbot can remind you of your tasks. My overuse of productivity apps — each of which do something slightly different — was the biggest obstacle in the way of getting my tasks in order. If you can’t integrate the apps with Zapier or IFTTT (it’s not always possible or practical), then make sure to at least keep a unified to-do list which links back to all of these places or you’ll end up spending time on checking up on your reminders on different platforms. Be realistic and admit you’re not going to get 25 items checked off today, and that will free mental space for you to check off the two which matter the most. Don’t cause problems before you start by treating projects as tasks which never get addressed — break them down and tackle them in pieces. When it comes to productivity, we’re our own worst enemies. Simply put, the biggest reason we don’t hit to-do list zero is because we make it impossible for ourselves. That said, once you know the barriers, you can break them with ease. Benjamin Brandall is a writer for Process Street. Find him on Twitter.